Jamaal Charles, a former Texas running back, was signed by the Jacksonville Jaguars. AUSTIN — Jamaal Charles is back. The former University of Texas Longhorn is back for an 11th season in the NFL just days after watching his alma mater beat University of Oklahoma and posing for a pic with Texas Gov. Greg Abbott at the Cotton Bowl. Charles was signed by the Jacksonville Jaguars on Tuesday and was introduced to the local media in Jacksonville, Florida the following day. "I've been out for a while and I'm stronger and faster and I feel great," said Charles. Charles experienced five 1000-plus yard rushings seasons in his first eight seasons in the league. But, a pair of knee injuries and another knee procedure slowed Charles down. He left Kansas City for Denver last season. "(The last couple of seasons) was a learning experience, things you've got to learn to go through and just keep on moving. I can't look back and get those years back," he said. His third stint as an NFL running back begins Sunday as a Jacksonville Jaguar. "I had my options open, but I wanted to play for a good team," said Charles with a laugh. His first game in a Jags uniform will include another first for Charles. The Jags will face the Dallas Cowboys inside of Jerry World in Arlington. Jamaal has never played a game in that stadium. Needless to say, it will be a homecoming for the Port Arthur, Texas native. "It will hyped up. Excited I can go back to Texas to see my family and make plays. I got a lot of uncles and cousins who like the Dallas Cowboys growing up as a fan. I'm excited to go play against them," said Charles. 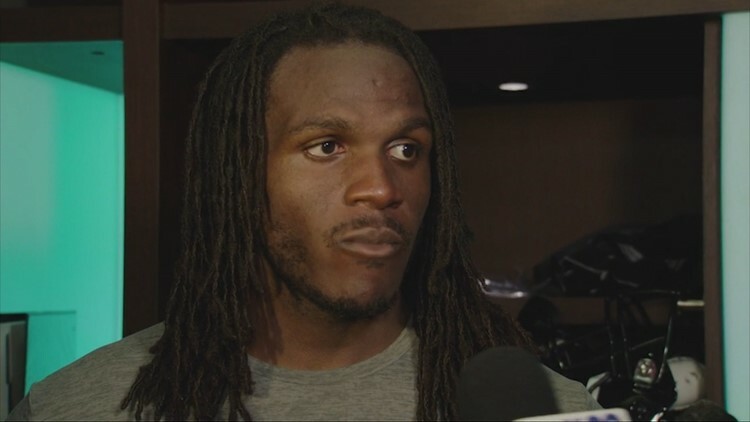 It sounds like Jamaal's family may be torn on Sunday.